The A-6 Intruder was conceived as a carrier based low-level attack bomber equipped specifically to deliver nuclear or conventional weapons on targets completely obscured by weather or darkness. The Intruder possesses outstanding range and endurance and carries a heavier and more varied load of stores than any previous US Naval attack aircraft. It currently equips 15 operational US Navy and Marine Corps Squadrons. In continuous production since the late 1950's, the Intruder established a production longevity record that is unlikely to be equaled by any combat aircraft type manufactured in the West. 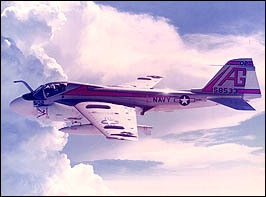 Grumman was selected to develop the Intruder in 1957 and the first one flew in 1959. Production continued on the ‘A' model through 1969 with just under 500 being built. It's distinctly utilitarian appearance belies the fact that the A-6 is a most sophisticated machine, effectively marrying computer technology with a sturdy airframe to produce a remarkably effective warplane. The last production version of the Intruder was the ‘E' model, updated with a new radar, computer and other improvements. Crewed by a pilot and bombardier/navigator (BN), it performs close air support, interdiction and deep-strike missions. It can detect, identify, track and destroy tactical targets in any weather, day or night. The Intruder's five pylons can carry any of more than 30 types of bombs, rockets, missiles or mines up to a total of 18,000 pounds. The BN operates the weapon delivery system, allowing the pilot to concentrate on tactical decisions. Unique displays show targets and geographical features to ensure accurate weapon delivery despite night or bad weather. The A6-E incorporates TRAM - Targe t Recognition Attack Multisensor. TRAM provides television-type imagery of targets not detectable visually or by radar and is coupled to laser-guided weapons. Another Intruder version, the KA-6D tanker, inflight refuels other aircraft, while the EA-6B Prowler is an electronics warfare aircraft used to suppress enemy air defenses. 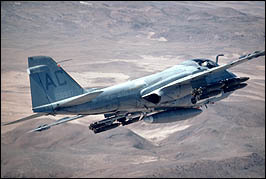 A-6's were widely used, and very effective, attack aircraft in both the Vietnam and Persian Gulf Wars. A total of 994 were built through 1993. This particular Intruder is an ‘F' model, with additional ordnance pylons, more powerful engines, new radars and digital avionics. It is one of three pre-production prototypes built at a cost of $220 million each in 1987. This aircraft was flown for a total of 2 1/2 hours before the program was canceled.